Ken Rinaldo is a Professor of Art in the Art & Technology Program at The Ohio State University. He has been teaching a course called New Media Robotics for 16 years, and many of the lessons in the book have been tested in his classes. Most of the artwork/inventions within are from professional artist/inventors from around the globe and some are from graduates of the Art & Technology Program at the Ohio State University and our undergraduate inventors. 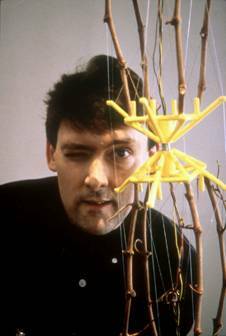 Ken Rinaldo has been exhibiting his robotic, 3D modeling rapid prototyping and biological artworks and lecturing about his invention and ideas nationally and internationally for over 30 years. Rinaldo has an Associates degree in Computer Science from Canada College California, a BA in Communications from the University of California, Santa Barbara, and a Masters of Fine Art from San Francisco State’s Conceptual Information Arts Program. Professor Rinaldo teaches robotics, 3D modeling, rapid prototyping, animation and motion graphics in the Art and Technology program of in the Department of Art at The Ohio State University. This book is dedicated to the love of my life Amy Youngs for her ongoing inspirational conversations surrounding the intersection of the arts, electronics, and biology and for all the wonderful collaboration throughout the years. MIDITRON TM board is a product of Eric Singer. BASIC Stamp, Board of Education, and Homework Board are registered trademarks of Parallax, Inc. Other brand and product names are trademarks or registered trademarks of their respective holders. Ken Rinaldo and assistants are not responsible for special, incidental, or consequential damages resulting from any breach of warranty, or under any legal theory, including lost profits, downtime, goodwill, damage to or replacement of equipment or property, and any costs or recovering, reprogramming, or reproducing any data stored in or used with any Parallax or other products used with this text. Ken Rinaldo is also not responsible for any personal damage, including that to life and health, resulting from use of any of the information in this book or products associated with this book. You take full responsibility for your electronics experimentation no matter how life threatening they may be.